There certainly are more great websites for books out there than I knew about. Excellent choices, especially as long as you like to use them. 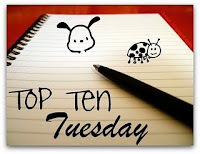 :) Here are my Top Ten Favorite Bookish Sites for this week. Thanks for the BBC Big Read! That's a new one to me! I've decided to use this week's assignment as an opportunity to compile a list of useful sites for me so I am "stealing" from others and adding them to my list for use in the future. I agree with you that this week's topic has me excited to learn about some new sites! You have some good ones on your list. I haven't used Ning too much yet, but I know there's lots more to explore. Will have to check out BBC Big Read next. I forgot to put it on my list, but Audible is a popular one -- lot of audio books, read by some amazing narrators. I'm also intrigued by Book Crossing. No worries about having a short list -- just leaves room for more fun stuff! I'll have to check out that BBC one. Great list! Short but all the essential ones are on there. Kindles and nooks? never thought I would read anything but a "real" book until I got my Kindle 1. Now I have the latest generation Kindle and am still in love. I also love Library Thing.